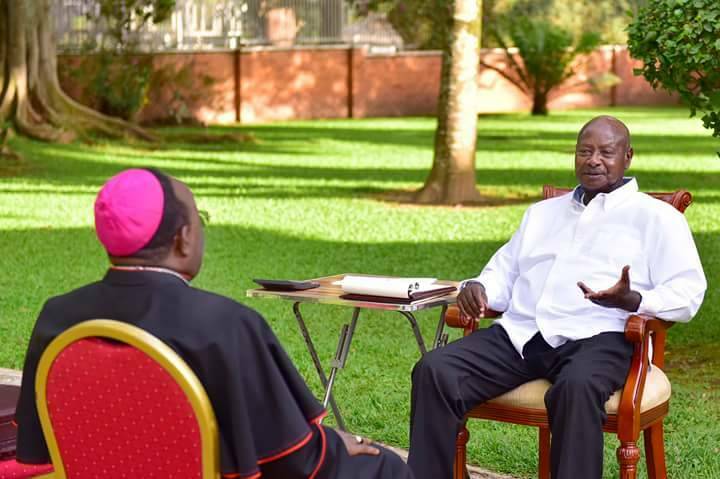 KAMPALA – President Museveni on Sunday met the Archbishop of Kampala Dr. Cyprian Kizito Lwanga in wake of the revelations by the Catholic prelate that intelligence services were profiling him and recruiting his priests to spy on the Church. 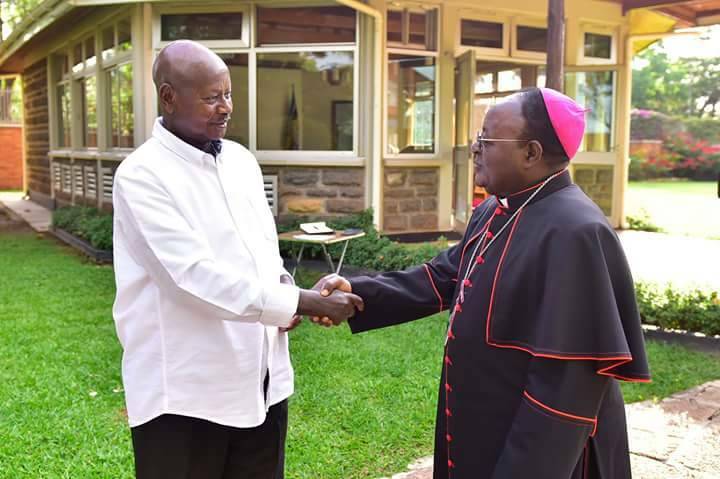 The President and Archbishop Lwanga met at the Nakasero State Lodge in Kampala, Presidential Press Secretary Ms Lindah Nabusayi announced on Monday, saying that the details of the meeting weren’t readily available. “The meeting comes at the heels of claims by the Archbishop on Easter Sunday that government has planted priests to spy on him,” Ms Nabusayi said. On Easter Monday, President Museveni spoke with the Archbishop over the phone and they later agreed to meet on a way forward on ironing out the standing matters, Ms Nabusayi said, indicating that the matter was now under investigation. “Investigations are already underway by the relevant authorities,” she said. While speaking at Old Kampala Secondary School playground on Good Friday, Archbishop Lwanga said someone told him that government had recruited church people to spy on him. He repeated the same fears during his Easter Sunday homily at Rubaga cathedral, where he indicated that a priest had died and in the aftermath of his funeral, state agents turned up to recover a gun they had given him. “A few days ago, I got a telephone call… it was a private [number]; so, I didn’t know [who was calling] and this person had an accent from western Uganda and this is what he told me, ‘there are many lies being told to the President; that… they have recruited your priests, your sisters, your brothers even catechists and seminarians…and we give them a lot of money”. “Some of the clergy that have been recruited are giving wrong information; terrible, terrible, terrible messages…This is the humble message I have for His Excellency and the government; you are recruiting wrong people…some of them we have dismissed and the people with that record are some of those who are shining as saints before you, talking about Archbishop Ntagali, myself and others,” Lwanga said. The caller reportedly warned Lwanga to be careful lest he becomes the next Janani Luwum; the former archbishop of the Church of Uganda. In the late 1970s, along with other churchmen, Luwum was accused of being an agent of former president Apollo Milton Obote and for committing treason. On the orders of Amin, he was arrested, publicly humiliated, then murdered in cold blood alongside cabinet ministers Charles Oboth Ofumbi and Erinayo Wilson Oryema in February 1977. He asked government security agencies to stop character assassinating people. “I call upon all of you to stop telling lies; stop misleading our president… Mr President, we love you very much and that’s why we have been electing. you. These people are your enemies; they are going to make you fail because your mind is poisoned and you act on that information,” Lwanga said. He also advised those church colleagues who are bearing false witness against him to instead join the government. “Jesus said you can’t serve two masters… the best thing is to resign and if it’s for the sake of getting money, I give this humble advice to Your Excellency; form a company of road builders among all those that you have recruited and work upon these bad roads which we have … and by so doing, they will be earning some good money instead of falling into sin,” he said. It is understood that Archbishop Lwanga’s outburst has unsettled President Museveni who has been on a collision course with the Catholic Church after the Uganda Episcopal Conference disapproved of the President’s funding of maverick priest Jacinto Kibuuka, who has attempted to split the Catholic Church. Kibuuka, who attempted would later consecrate himself a Bishop in the Eastern Right of the Catholic Church has since written to State House complaining of freezed funding.